There is nothing I love more than mac + cheese. And I'm not fussy about it either. I practically lived off of Annie's mac + cheese in college, so much so that I would mess with the boxed stuff to make it my own. Chiles in adobo? Wild mushroom + rosemary? Yeah, I made those happen. But I never really attempted my own mac + cheese recipe. Something was always daunting about building the sauce PLUS really looking at all of the butter, cheese + milk that goes into it is freaky. So when I wanted to make my own, I went a different route. 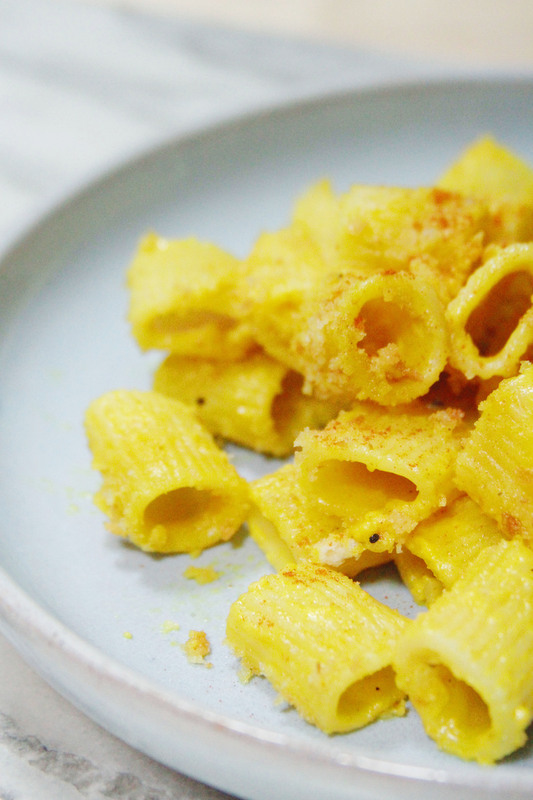 Coconut milk builds the base of this mac + cheese. I love the flavor + how creamy it is, but it's way lighter than a traditional base. 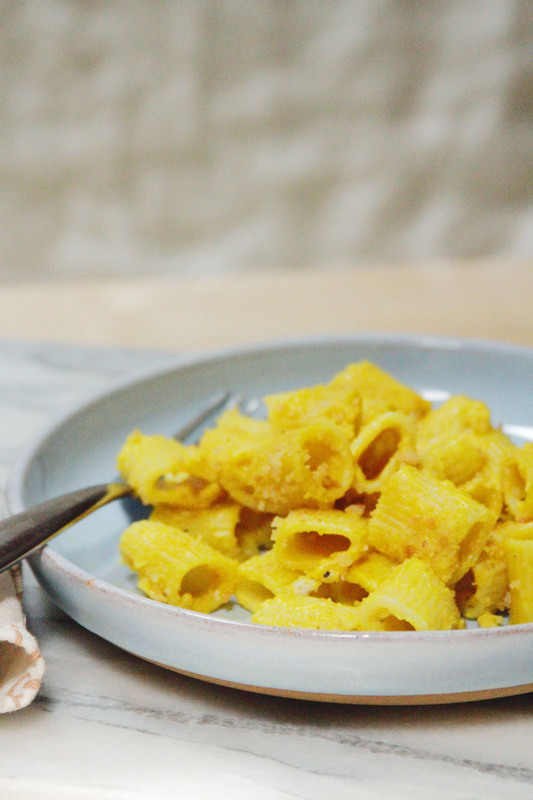 There's a teeny bit of cheddar in this mac + cheese, but a majority of the color (plus flavor) comes from smoked paprika + turmeric. It's indulgent, but definitely not your typical BBQ eats for Memorial Day weekend. Oh and that reminds me! Scroll down to the bottom of this post for a special BBQ surprise! Start by cooking the mezzi rigatoni to al dente according to your package instructions. Drain the pasta + return the pot to the burner. Add the coconut milk to the pot + bring it to boil on medium heat. Reduce the heat to low + continue to stir until the milk slightly thickens. Add the flour + stir. The coconut milk should thicken considerably when you do. Continue stirring while adding the turmeric, smoked paprika + cheddar cheese. Allow the cheese to melt then add the rigatoni to the pot. Stir to make sure the sauce coats the pasta. Add salt + pepper to taste. Add the pasta + sauce to a shallow baking dish, + set aside. To make the topping combine the breadcrumbs + melted butter. Evenly top the mac + cheese with the breadcrumb mixture. Bake the mac + cheese in the oven until the breadcrumbs brown, around 20 minutes. Enjoy right away. And oh yes! With the upcoming holiday, it's basically the start of barbecue season! 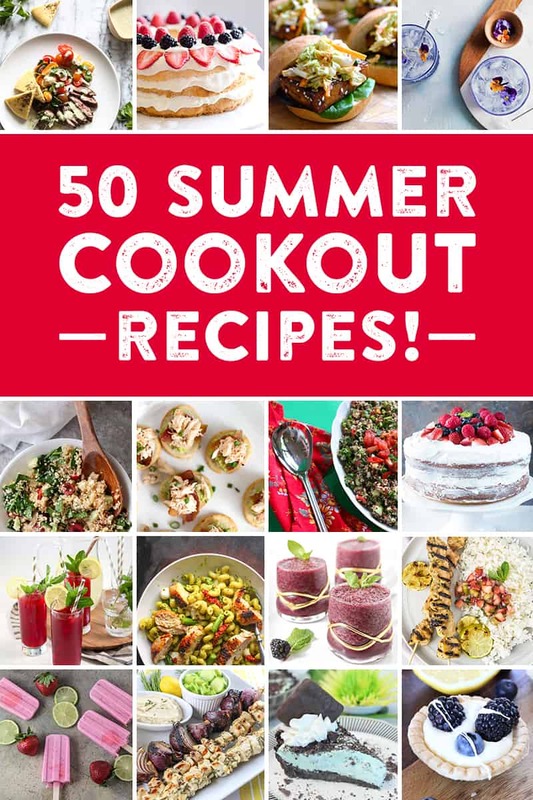 In celebration, I've teamed up with fellow bloggers to bring you 50+ recipe ideas for your summer plans. See all the recipes for our Great Blogger BBQ below!